An obsessive stitcher, history junkie and tree-hugger. A teenage hippy masquerading as a middle-aged housewife. Do you ever watch the TV show Grand Designs? 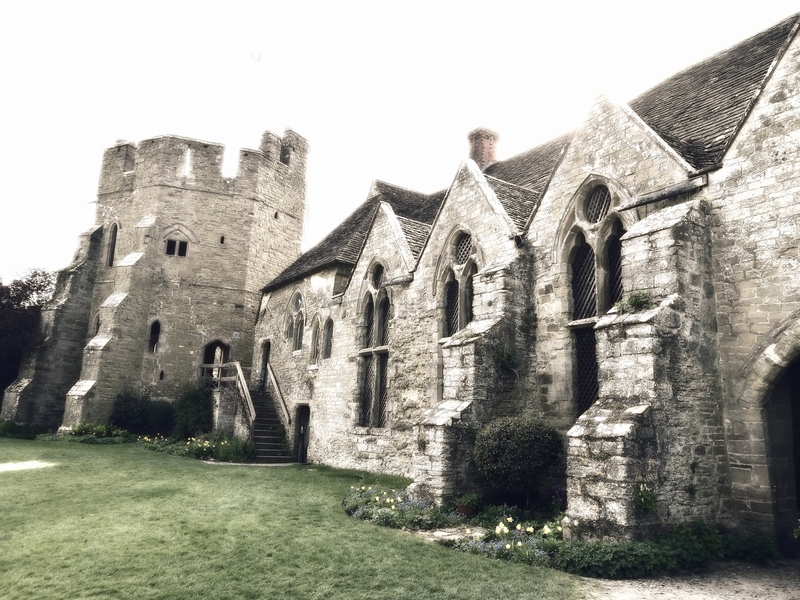 (I’m sure similar programmes exist across the world, where you follow people through the process of building their own houses) – I ask because for some reason, whenever I visit Stokesay Castle I can’t help thinking that if it had existed in the 1290s, Stokesay Castle would definitely have been featured. 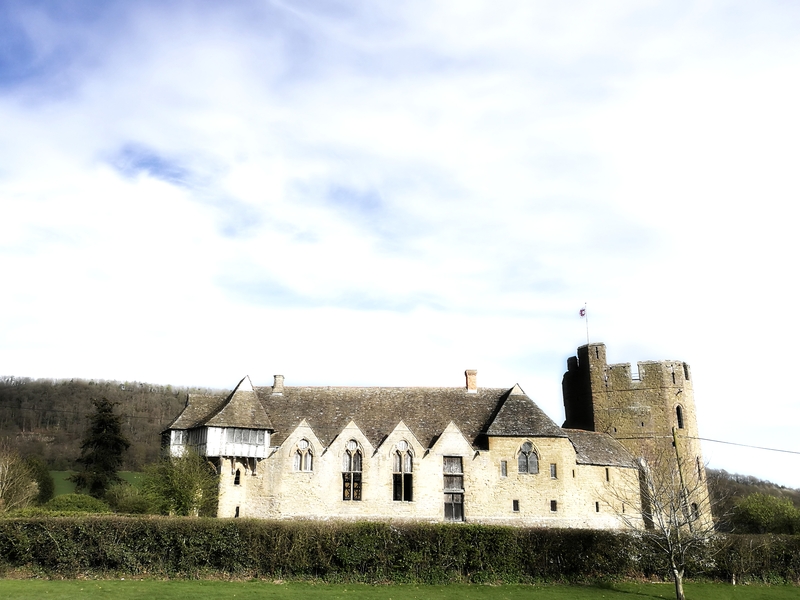 It’s fantasy of course, but you can’t help thinking that Stokesay was always meant to be someones vanity project, a way of announcing to the world that you’d arrived. Although it does have some castle-like features, it was never really intended to be a stronghold, this was first and foremost a rich man’s comfortable home in the country, a statement about wealth, not a fortress, despite being set in an area where true castles abound. The writer Norman Pound described it as ‘pretentious and comfortable’ – difficult to argue with that. Although I do wonder what Laurence’s noble neighbours made of him. And for the thirteenth century it was pretty well-appointed. A huge hall with tall windows in the main public space, a solar suite for him and his family and a series of guest rooms. There are toilets and fireplaces built-in which was no doubt pretty avant guard for homes back then. 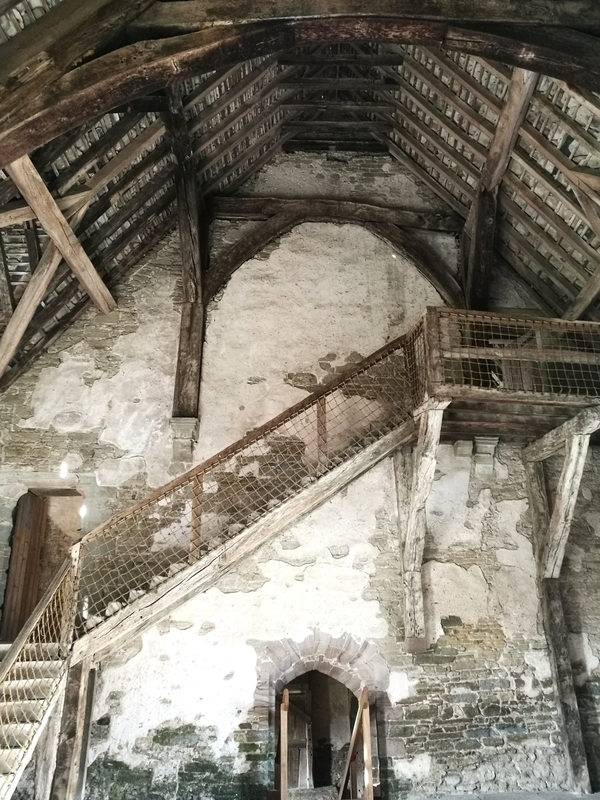 Going to Stokesay today it’s easy to let your mind slip you back into the thirteenth century because there’s so little change from the shell of the building that was first built for Laurence. And it is undoubtedly a very lucky building indeed – to have sat right in the middle of some of the most heavily fought over land in the English / Welsh borders for 700 years and to remain very largely intact is nothing short of miraculous. Its only real encounter with destiny was towards the end of the English Civil War when it was besieged in 1645. It surrendered to the Parliamentarians (quickly demonstrating it’s lack of proper defences). 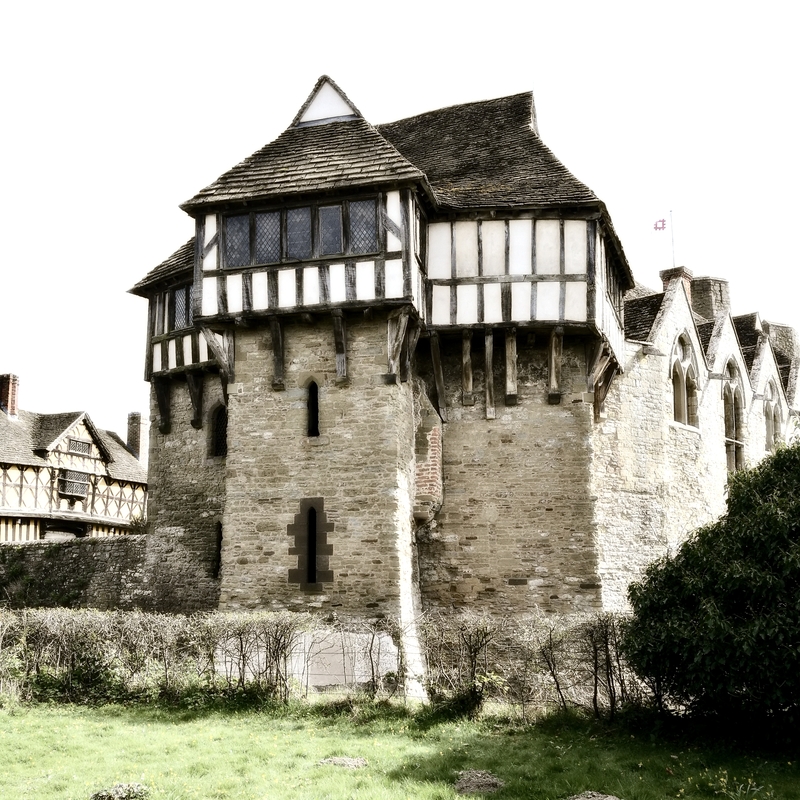 Unlike so many castles subsequently ordered to be slighted, Stokesay got off very lightly – where some castles were to all intents and purposes demolished, Stokesay doesn’t appear to have suffered more than the loss of a few feet off the height of its curtain wall. The solar is the one room in the castle to have been significantly updated in the seventeenth century. 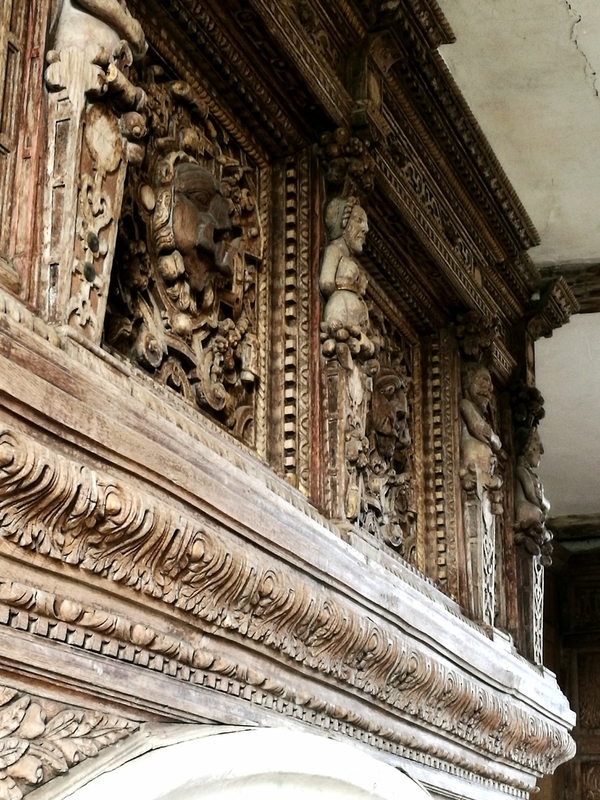 The carving in the wooden mantelpiece is a tour de force. After that fling with fate, Stokesay was gradually left to slide into decline and could easily have literally crumbled away, but it was lucky once again to have found a series of restorers in the nineteenth century who all decided to conserve rather than change the building, keeping intervention to a minimum, and as a result we now have this almost unique example of a fortified manor house to wander around and enjoy. 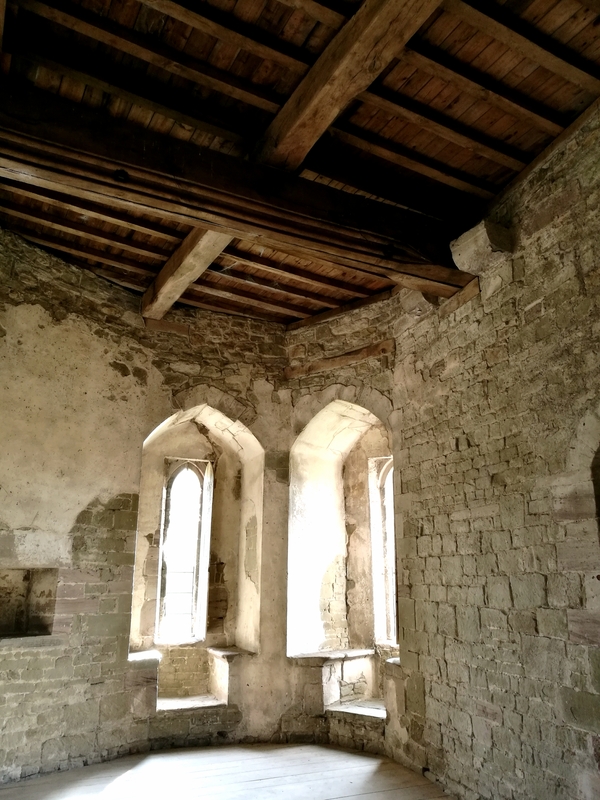 The windows are what really make it for me at Stokesay, but then windows are always magical frames of liminal space. Looking out or looking in, there’s always a story. Although Grand Designs is supposed to be about the buildings, there’s no doubt that it often also charts the impact of the stress of building on the people involved – marital strains are not uncommon. What Laurence and his family experienced we’ll never really know, but sadly he was to drown at sea in 1294, so it’s unlikely he enjoyed much time in his own grand design. Still, over 700 years later, I’d like to thank him. 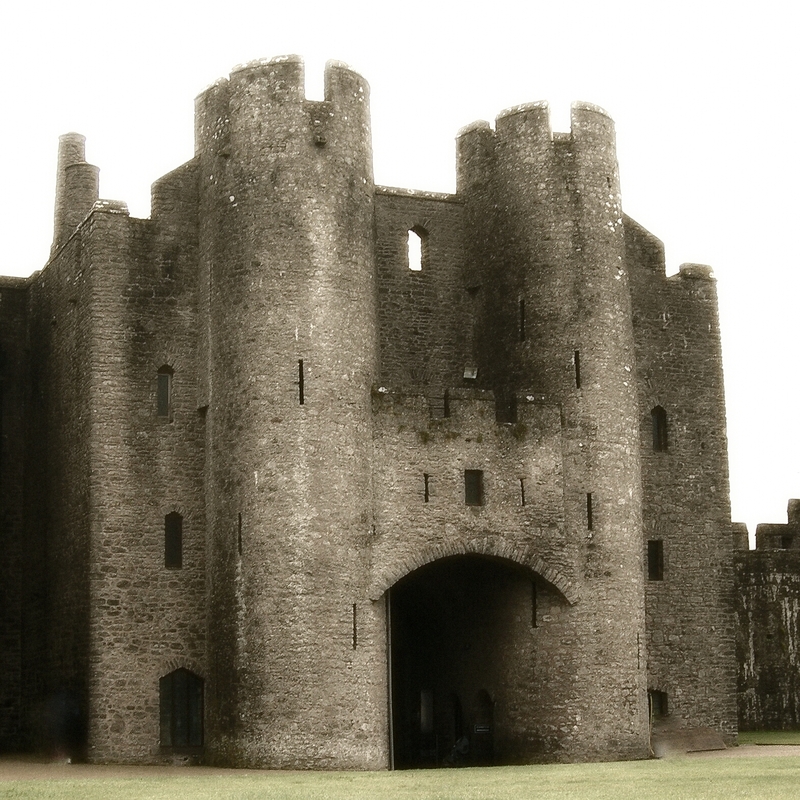 He built his castle, and he left us with a remarkable window into the thirteenth century. This is the link to visitor information at English Heritage. The last place we visited during our Easter break was the small-but-perfectly-formed Buildwas Abbey near Telford, Shropshire. It’s definitely in the ‘hidden gem’ category, in fact anyone visiting needs to keep a good look out for the signs or you’ll still miss it, nestled away as it is in a curve of the River Severn, at the bottom of a long hill. But assuming you make it, Buildwas will definitely repay your endeavour. 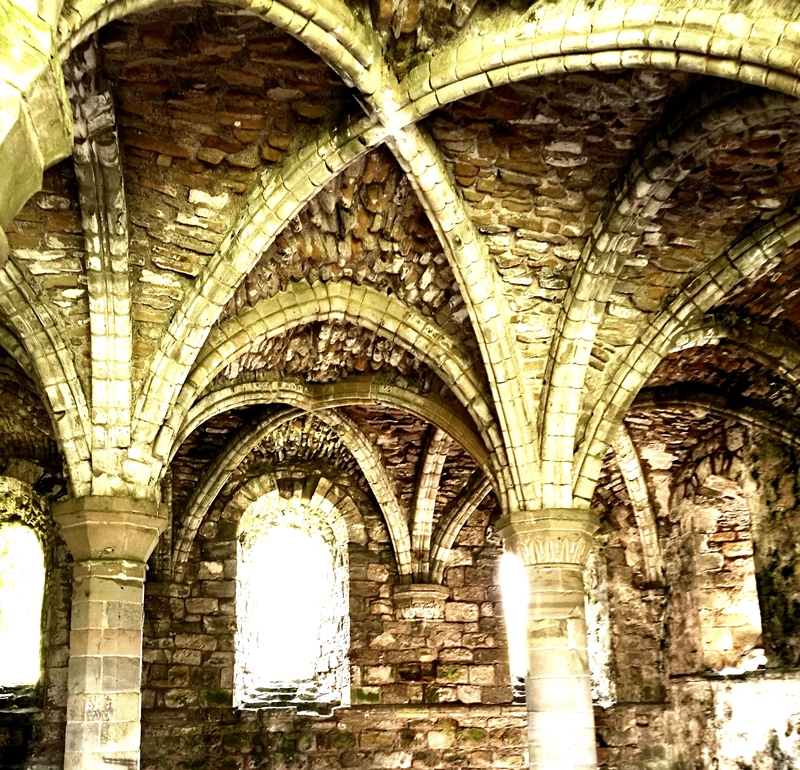 It’s an absolutely charming example of an early Cistercian abbey, now ruined of course but with some of the chunkiest round pillars the Normans built still standing and a Chapter House that will have you eagerly snapping away with your camera. The story of Buildwas isn’t about any particular person, rather it’s a demonstration in the landscape of a slice of English/Welsh history. It’s location is in the long disputed and frequently fought over borderlands between England and Wales. It was originally founded by a conquering Norman bishop (Roger de Clinton) bringing a group of Norman monks from Savigny to England in 1135, it soon after became a Cistercian monastery in 1147 and the remains of the building we can still see date from the 1150s through to the 1330s. One of the things I love about Buildwas is that enough of its history if known to give you the bones of a story, but there are sufficient grey areas where your own imagination can take over and fill in the gaps. So for instance, in 1340 an unnamed abbot of Buildwas was murdered – but the man arrested staged an escape. 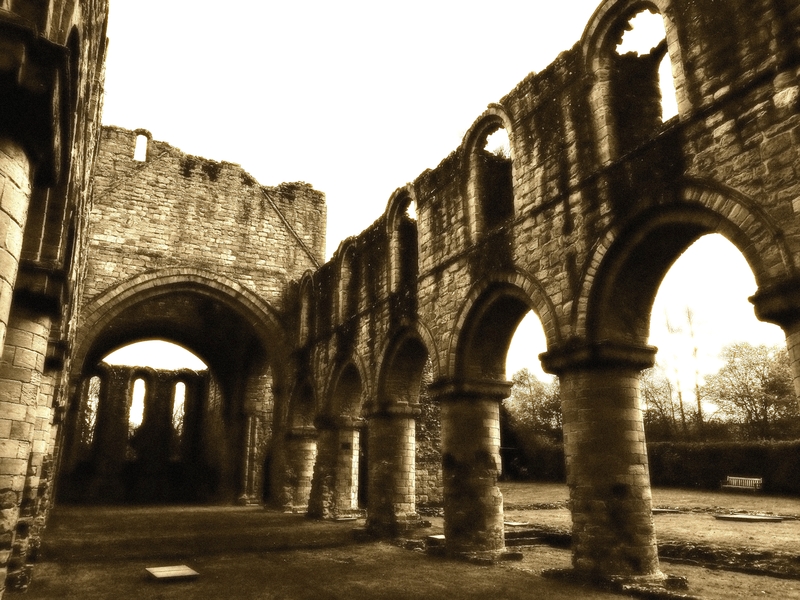 In 1350 the abbey was raided by the Welsh who took the abbot and monks prisoner. We don’t know what impact the Black Death had precisely, but in 1377 there were only 6 monks there, and in 1381 only 4 – why? Now if that isn’t enough to get the historic mystery writers juices flowing, I don’t know what is. (By the way, I heard this sort of writing referred to as mystoric fiction – I hadn’t heard that before, but I thought it was brilliant). I must admit, even while I was walking around I was thinking about the wonderful Ellis Peters Cadfael novels, you could just see Cadfael in his herb garden there. But the mystery and murder also made me think of the C J Sansom Shardlake novels. Have you read these? They seem perfect companions for Buildwas. Way back during the early part of Buildwas’s history, the abbey owned a large number of books (by the standards of those days) – estimated at over 100 religious texts – reading being one of the important elements of the Rule of St Benedict and a daily requirement. Apparently over 40 of those books still survive and it’s believed that 15 of those were actually written at Buildwas Abbey. Not a bad legacy for a small foundation in the borders. As was often the case, once the abbey was dissolved, it quickly declined, having been plundered for building stone and materials. Even the grand Tudor house that replaced part of it has subsequently been lost. Which means that today you see a truly romantic ruin set in the loveliest rural setting, with lots of lumpy earthworks all around certain to make your inner archaeologist desperate to wield a trowel. I don’t think English Heritage would be too impressed if you actually tried, so instead it’s probably best to let the abbey inspire your artistic streak. Don’t go without your camera or you’ll regret it. And if it’s a nice day and you’re happy working en plein air, you’ll be painting in the footsteps of John Sell Cotman and JMW Turner who amongst many others have all been inspired to paint the ruins at Buildwas. Finally I should say that I felt an especially lovely atmosphere there, it’s the sort of place I really do think you could sit and meditate quietly. Monastic or otherwise, it has a certain serenity and I adore it. I hope if you visit you do too. Buildwas isn’t open every day. Check here at the official English Heritage website before you go. There are portaloos in the car park, no permanent facilities. The lady at the ticket office made us the very best coffee we’d had for the whole week of our holiday – just saying. Now, if you want VERY detailed history about Buildwas – and I admit to being fascinated – go to this website – but be prepared. Cadfael – Derek Jacobi or Philip Madoc? Sorry to disappear last week – it’s what happens when your youngest comes in and drops the comment that she’s got her holiday dates wrong and instead of going away this week after the Easter break, we had to rush off immediately for a few days squeezed between commitments. But luckily for us the weather was good and so we took the tents over to Shropshire, for what turned out to be a really lovely few days, with bucket loads of heritage-hunting! I’ll sit down and share the stories of some of the places we visited soon, including the fabulous medieval Stokesay Castle (above), but if you’re looking for an area to visit that takes you away from the hoards and shows you history throughout the ages, there are few better counties than Shropshire and the Welsh Marches. We were there for five days and in that time toured six castles (Stokesay, Powis, Ludlow, Hopton, Montgomery and Clun), two abbeys (Much Wenlock Priory and Buildwas Abbey), two hill-forts (on the hillside above the campsite) and a bronze age stone circle (Mitchell’s Fold) and for much of the time we were the only people at the sites, so much lovelier I think than having to push through crowds. I’m a massive fan of these hidden gems. And besides the abundant heritage, there’s the simply wonderful scenery to enjoy too. I’ve always loved walking up hills and as we don’t have that many in Bedfordshire I was very happy to trot up as many as we could manage (alright, maybe not exactly trot, but I make it up with a liberal smattering of ‘awe and wonder’ stops). We made it up the Long Mynd, the Stiperstones, Corndon Hill, and along a section of Offa’s Dyke from Knighton. My leg muscles are definitely feeling it now. We camped on the edge of the Long Mynd (it was extreme camping but in a wonderful location – if you’re slightly mad and want the details, leave me a comment or send me a tweet). After all that sight-seeing and exercise, I was very glad to roll into a pub each evening for a pint of Three Tuns beer. I think a visit to the Three Tuns in Bishop’s Castle might be a legal requirement of visiting Shropshire – we certainly always pay homage there, but in fact it turned out that the pub closest to our campsite (The Bridges Pub, Ratlinghope) was also owned by the brewery and I have to say kept their beer extremely well. The food was fabulous there too, so I’d be more than happy to go again. (I’ve put a link to their website here in case anyone is interested, because they offer a variety of accommodation too, which seems like an ideal arrangement should camping without any mod cons not be to your liking – ahem). So, it’s back into the swing of things again now just as soon as I get through the mountain of post-holiday laundry. Just before we set off for our break I started two new stitchy pieces which are calling to me now to get on with, but that will have to wait for a day or two – I’ll show you them soon. Pembroke Castle with the Great Keep on the left. William Marshall had an extraordinary life. He was born in 1146 (or possibly 1147, it’s a grey area) to fairly lowly Anglo-Norman knightly stock, but through his immense courage and loyalty he rose in importance to play vital roles during the reigns of Henry II, Richard I, John and John’s son Henry III for whom he was appointed protector in 1216. If you haven’t heard of him, there’s a fabulous biography ‘ The Greatest Knight’ – by Thomas Asbridge *, which is every bit as exciting as any fiction. I won’t bore you with oodles of details here, but suffice to say he got around a bit and fought a lot of fights through his 70+ years – (he led the charge at the battle of Lincoln aged 70). In 1189 at the age of 43 he married 17-year-old Isabel de Clare (he was given her by Richard I as a reward for his support) and it was through her that he became owner of Pembroke Castle (and indeed a number of other castles – we’ll no doubt meet William quite often as we wander around the castles of Wales and the Marches). They went on to have 5 sons and 5 daughters, which was no mean feat and certainly provides fiction writers with plenty of possibilities. How much time he spent at Pembroke I’m not sure, in those days practically all the aristocracy lived largely peripatetic lives, but he is credited with having had the castle built in stone and for building the Great Keep – it’s a massive cylindrical tower with a stone domed roof, nearly 80′ high (you can walk up and on to it to see the views, although I have to say it brought me as close to vertigo as I’ve ever been). It’s impressive today and must have been even more so in the twelfth century. We have William Marshall to thank for several things, including witnessing and then re-issuing Magna Carta. His descendants include both the Bruce and Stewart kings of Scotland, Edward IV of England and through him, Henry VIII and all English monarchs afterwards. He died in 1219 and is buried in the Temple Church, London where you can still see his tomb. Isabel died a year later. There are loads of stories featuring William, including novels by Jean Plaidy, Sharon Kay Penman and Elizabeth Chadwick. Have you read any of them? Which ones would you recommend? I’ve read that he may have been the inspiration for William Thatcher in the film A Knight’s Tale – I love that film although it’s set years later, I sort of hope it’s true. Now Margaret Beaufort may not have built anything at Pembroke, but in a way you could claim that it was where the Tudor dynasty began, because it was in a tower at the castle on the 28th of January 1457 that Margaret gave birth to her son Henry, who would go on largely through the political manoeuvring of Margaret to become King Henry VII in 1485. Margaret’s story is just as amazing as William’s. She was married at the age of 12 to Henry VI’s half-brother the 24-year-old Edmund Tudor. The Wars of the Roses were intimately entwined in her life and Edmund died in captivity at Carmarthen shortly after their marriage, but not before she became pregnant. She gave birth in Pembroke Castle aged just 13. Henry was her only child even though she married twice more, so I think we can imagine it would have been a pretty horrendous experience. Like William, the life of Margaret has been the subject of numerous novels, including the enormously popular books by Philippa Gregory – Margaret is the Red Queen (I’m going to be honest and admit to not having read any of them). I know Margaret was a remarkable woman and you have to admire the way she struggled through the twists and turns of fate to bring Henry to the throne, but I’ve never been able to like her – is there a novel I should read that will change my mind? Anyway, she outlived Henry VII and watched her grandson Henry VIII being crowned in 1509 shortly before her death. Quite some woman whatever you may think. Click here to go to the official Pembroke Castle website where you can check opening hours, tickets prices, history timeline and the like – they have all sorts of events there too, including after hours ghost walks – sounds like fun. * Here’s a link to Thomas Asbridge’s website – if you aren’t familiar with William Marshall, try Asbridge’s book or search out the documentary he made about him – it’s ‘boy’s own’ stuff really it is. Does anyone know of a good biography of Margaret Beaufort, surely there must be one? If you want a good article about her, I thought this piece from History Today by Michael Jones was useful. 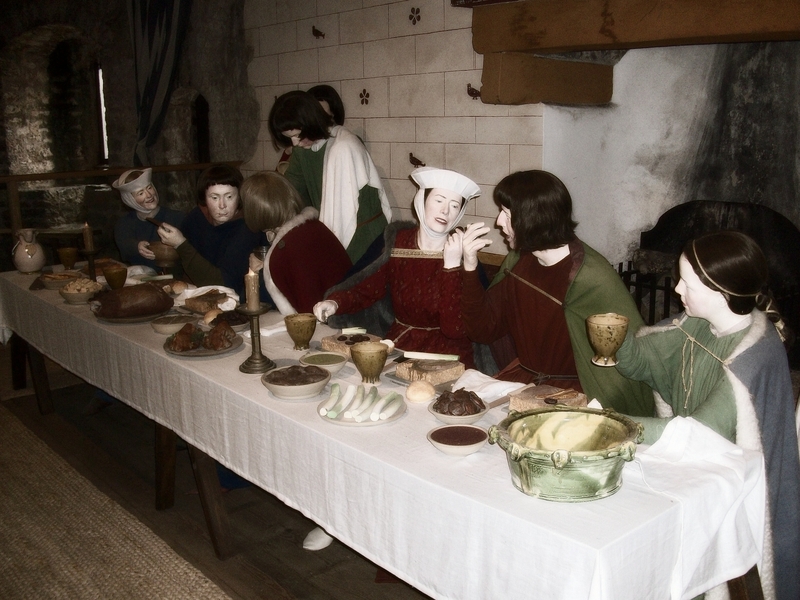 Banqueting ‘medieval style’ – one of the tableaux at Pembroke Castle. Just to say, there’s lots to see at Pembroke Castle that I haven’t attempted to mention here, but it’s a brilliant place to visit if you’re in the area. It’s privately owned and I love the approach they take to heritage and history, it’s a castle where you feel welcome and connected. After all the grandeur of Gloucester Cathedral last week, I thought for this week’s helping of heritage-hunting I’d choose something a little more domestic – although it does have a monastic connection – Canons Ashby, Northamptonshire. 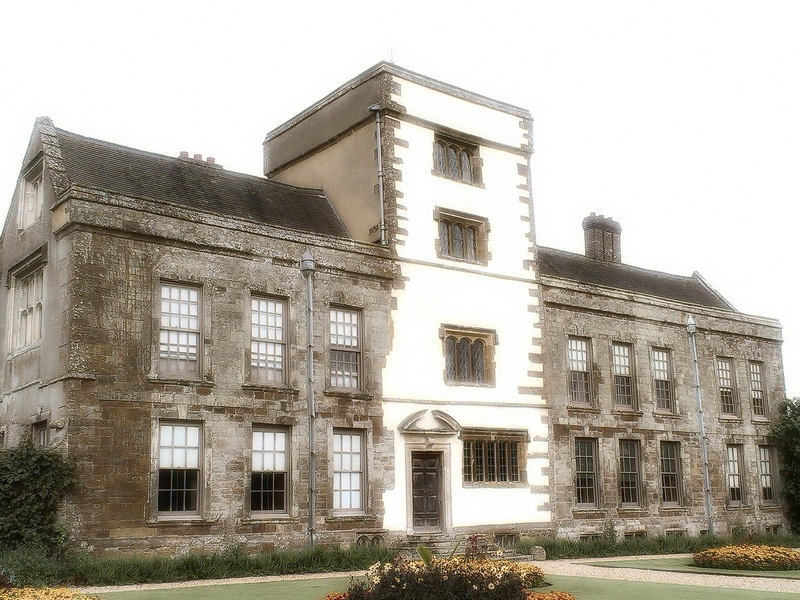 It’s an Elizabethan manor house, built beside the remains of the Augustinian Priory of Canons Ashby, which went the way of those places at the Dissolution (what remains of the Priory is now the somewhat truncated village church). Canons Ashby house is at the ‘ooh, I could imagine myself living here’ end of the spectrum rather than one of the jaw-dropping Chatsworth, Woburn or Blenheim types. Nevertheless, it’s somewhere I love visiting because it has that rare quality of being largely unchanged since the last phase of building work there in 1710. If you choose your time and day to visit when there aren’t too many other people wandering around, you can almost imagine yourself back in the eighteenth century. Half close your eyes and let your senses bring you the drifting scent of candles and listen for the gentle rustle of silk skirts, perhaps you’ll catch a glimpse of a servant on the stairs. It was for many years the family home of the Drydens (not actually the home of the poet and political satirist John Dryden, but they were closely related) and it still feels like a family home to me even though it’s now being shared with all of us visitors. I love the way you’re able to see so many of the rooms, grand and less than grand. There’s one much more recent resident of the house we do know about – have you heard of Louis Osman? He was the goldsmith who made the crown used at the investiture of Prince Charles as Prince of Wales in 1969 and he lived here from 1969 until 1979. (Although I can’t say it’s something I’d ever want to wear, not that that’s an issue – ahem…). Although naturally we all think we’d have been the ones swanning around giving the orders in these old places, I suppose it’s more likely that we’d have been slaving away in the kitchens, but Canons Ashby has a fabulous old kitchen, worth the visit for that alone (well I think so). 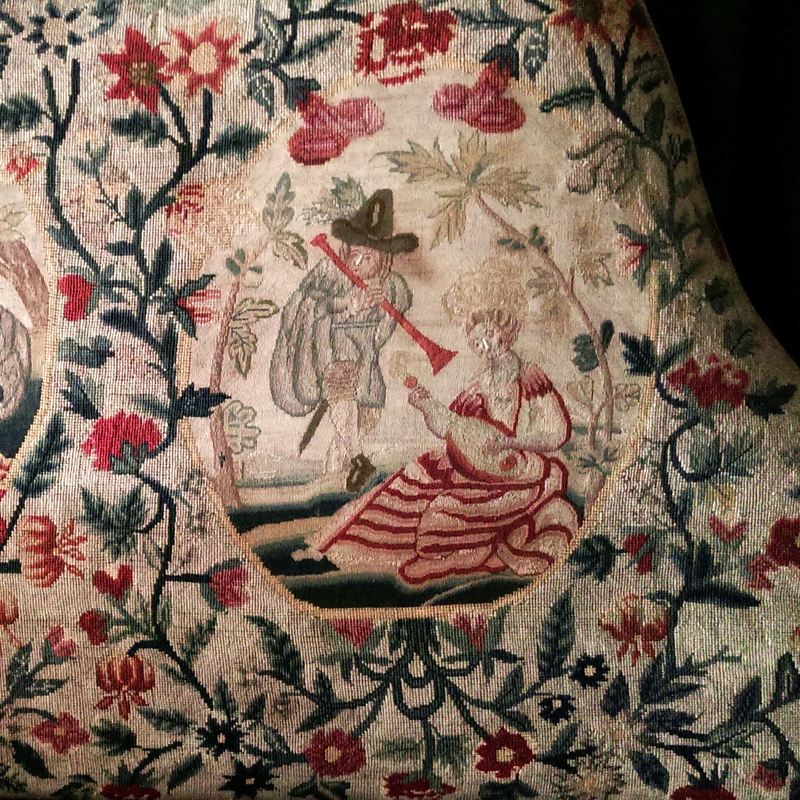 The other big draw of Canons Ashby for me is the wonderful amount of needlepoint and woven textiles around the house. It’s not so easy when the house is busy, but there have been days when it’s quiet that I’ve managed to spend really quite a long time peering at the stitched work (and getting some odd looks from the room-guides). I always find myself thinking about the people who stitched away at those pieces and the lives they lived and what they’d think if they knew we were still admiring their work hundreds of years later. Just as lovely as the house itself are the gardens, which are gradually being restored. Go on a fine day and you’ll probably want to spend as long there as inside. One day when it’s really warm I’m going to pack up my stitching, drive over to Canons Ashby, settle myself into a garden seat and stitch away the afternoon there. Don’t miss the statue of Sam the shepherd boy which commemorates a sad event during the English Civil War when the pro-Parliament Drydens offered food and ale to a group of Roundhead soldiers and set their shepherd lad to watch out and alert the soldiers if any Royalist troops arrived – when they did arrive and the boy played his whistle to raise the alarm, the Royalists took vengeance and killed him. 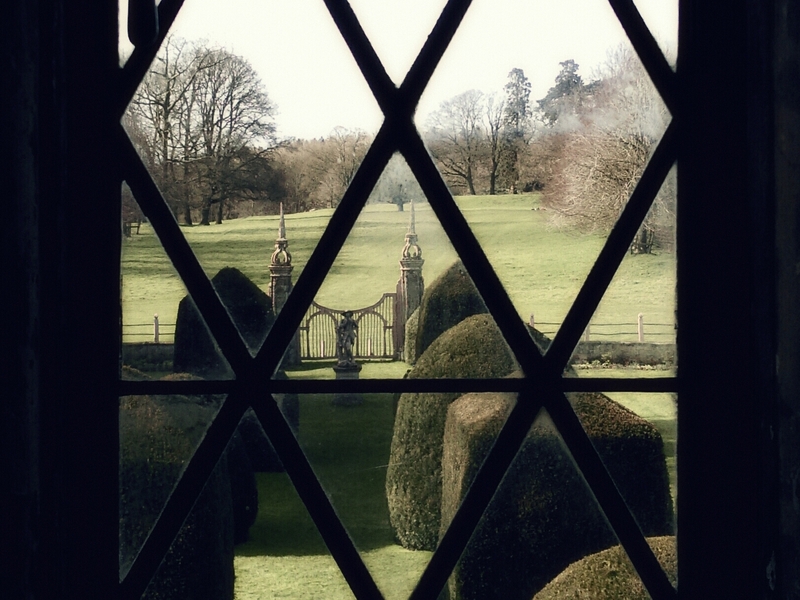 Gaze through the window and spot Sam the shepherd still guarding Canons Ashby. If you have enough time, wander over to the church which dates from 1250 and which is all that remains of the Priory – as with other churches ‘cut down’ from monastic sites, it feels a bit oddly proportioned, which I suppose is entirely understandable. Click here for the National Trust’s official website, it has details of opening times, ticket prices and other useful information. I should mention that there’s a lovely cafe there too but if the weather is good you might prefer to take a picnic – there’s plenty of space and on a hot summer afternoon it feels dreamy. Bookworms should know that there’s a small second-hand bookshop in the courtyard too, you might want to allow yourself a few extra minutes for a browse around. 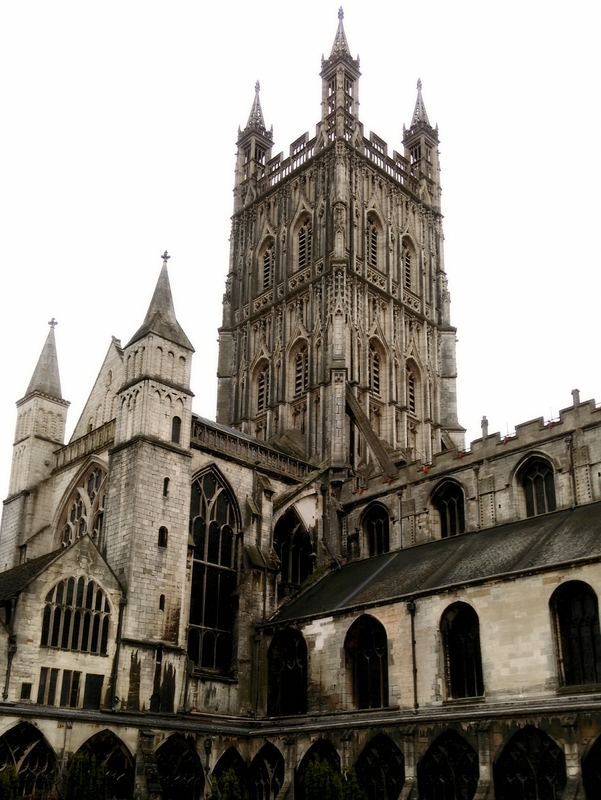 Gloucester Cathedral – 5 things you shouldn’t miss. For me, Gloucester Cathedral has to be one of the most overwhelmingly lovely places in England, but I have to say it was difficult to decide how to begin talking about it here, because quite frankly there’s too much delicious history stuff there to choose from. I was definitely in danger of going into fact and date overload. So instead, I decided to pick just five things I wouldn’t want to miss – of course your choice might very well be entirely different, and if you’re a Gloucester Cathedral fan I hope you’ll take a moment to share what you’d have included too. If after all this you’re left wanting to know more, I’ve added a selection of links at the end of this post to help you explore further. Buried beneath a rather splendid canopied shrine, with a lion at his feet and angels at his head, is the unfortunate King Edward II (died 1327), who history says was gruesomely murdered at Berkeley Castle with the wincingly unpleasant application of a red hot poker to his nether regions. (If you visit Berkeley Castle you can still see the room where his murder was said to have been committed and where it’s said you can hear his cries each year on the 21st of September, the anniversary of his death). Over the course of his reign, Edward had managed to seriously annoy powerful factions at court through his friendships with first Piers Gaveston and later Hugh Despenser. Eventually this provoked Edward’s wife Queen Isabella and baron’s leader Roger Mortimer to revolt and in April 1327 Edward was forced to abdicate in favour of his teenage son who then became King Edward III, with Isabella and Mortimer effectively ruling in his name. How exactly he really did meet his end isn’t known and a number of theories exist, including one which several historians believe, that he wasn’t murdered there at all, but instead was able, or enabled, to escape to the continent where he later met his son Edward III in Antwerp in 1338. As it happened, things didn’t turn out too well for Isabella or Roger Mortimer either. Having rid themselves of Edward they went on to make many of the same mistakes and were themselves brutally removed from power just three years later when Edward III seized control from his mother and Mortimer. Isabella was allowed to retire to her castles (Castle Rising in Norfolk where she lived is a wonderful place to visit), but Mortimer was quickly executed, having been blamed for murdering Edward II. 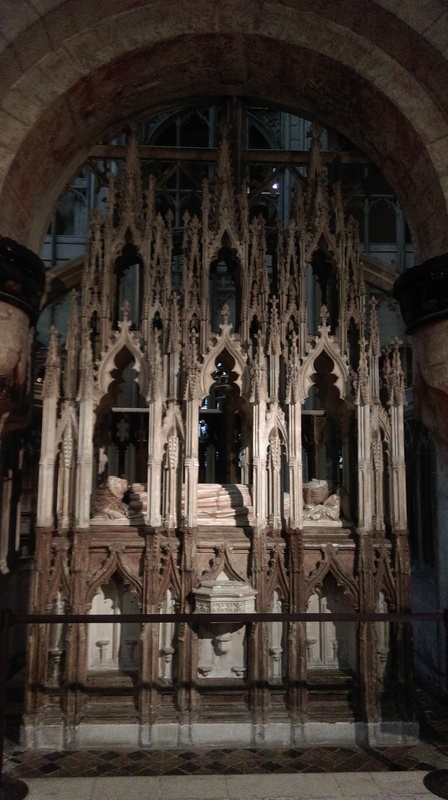 Whatever the truth about Edward II’s death, Edward III went to some trouble to have his father remembered with this elaborate tomb, and the monks at Gloucester (which in those days was an abbey) did very well indeed from the numerous pilgrims who came to pray here. So well in fact that later in the 14th century it was possible for them to carry out the building of what must be some of the most beautiful English Perpendicular architecture in the country. So in a way, whatever Edward’s fate, you could argue that he has left us a magnificent and poignant legacy in stone, albeit not of his design. I’m not sure that the face of the effigy is a likeness of the king, but to me it seems extremely melancholy and indeed I suppose he had much to regret. But then I wonder if in some ways he didn’t have the last laugh, because whilst he has this magnificent shrine and still draws visitors nearly 700 years later, there is no trace remaining of the burial places of either his queen Isabella or Roger Mortimer. (Isabella had been buried in Christ Church Greyfriars, London, but that was destroyed in the Great Fire of London, and the Wren church which replaced it was destroyed in the Blitz during WW2. Roger poor chap was probably buried in Wigmore Abbey amongst his Mortimer family, only ruins now remain there). 2. 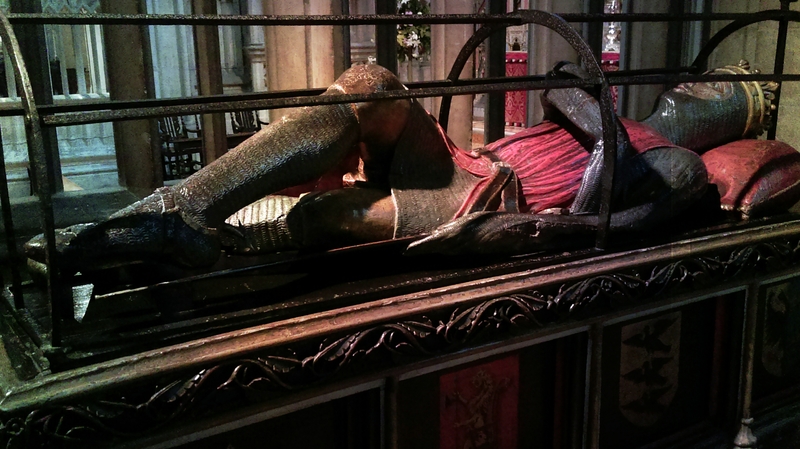 The effigy of Robert Curthose – Duke of Normandy. As if one awkward royal wasn’t enough, Gloucester Cathedral can boast another. Across the aisle from Edward II, you’ll find the effigy of another wayward chap, Robert Curthose, the eldest son of William the Conqueror. Why you might wonder wasn’t he a king of England if he was the eldest son, but according to history, Robert and his father had some major fallings-out (this seems to be a recurring theme with medieval monarchs), and so William divided his lands in England and Normandy between Robert and his younger brother William, Robert getting Normandy and William inheriting England (and becoming William Rufus). Things didn’t exactly run smoothly between them (Robert sounds like a bit of a lad one way or another) and when William died without an heir, it was their youngest brother Henry who seized the throne, despite Robert’s attempts to take it for himself. Not long after, Robert was imprisoned by Henry and spent the rest of his long life a prisoner in Cardiff Castle. He died in 1134 aged 83 and is buried in the cathedral. But the reason for telling you this is just to set the scene, because what I love is Robert’s effigy itself and the curious position he’s lying in. It’s made from bogwood and dates to about 100 years after his death. And here’s the mystery – what exactly is he doing with his leg and his arm? He looks as if he’s doing some kind or yoga pose. It’s probable that originally he was holding something, but nobody seems to know what that was. As a result he remains stuck in this peculiar stance for all time. 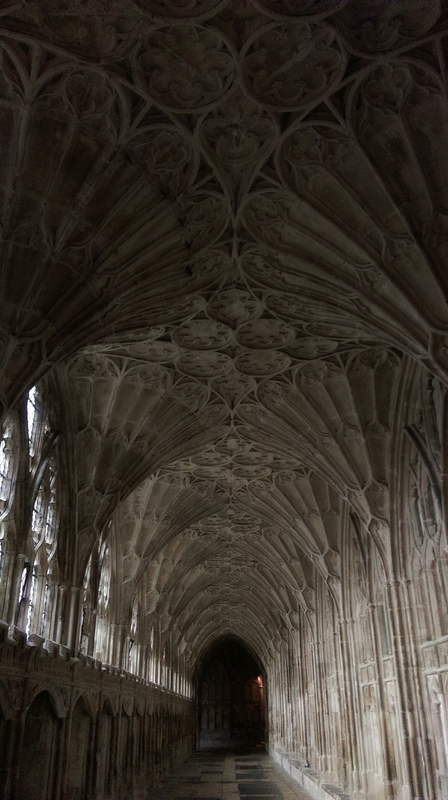 Now the cloisters at Gloucester are without doubt simply magnificent, the sheer beauty of the vaulting, the windows and the disappearing vanishing points are breathtaking. Thinking about it, this is the one thing I really wouldn’t miss, and where I’d go if I could only see one thing there. But there’s another reason why they’re so popular and why I bet they get many visitors and it’s because they were used as a set for parts of Hogwarts in the Harry Potter films. I found a charming home video on YouTube of a visit to the film locations with a Cathedral guide pointing out the precise spots – it’s cute if you’re into that sort of thing have a look. 4. The Stained Glass Windows. A visit to Gloucester isn’t all kings and wizards though. One thing you can’t miss is the simply mind-blowing stained glass, including the extraordinary East Window which is bigger than a tennis court and certainly makes your neck ache if you stand looking up at it. 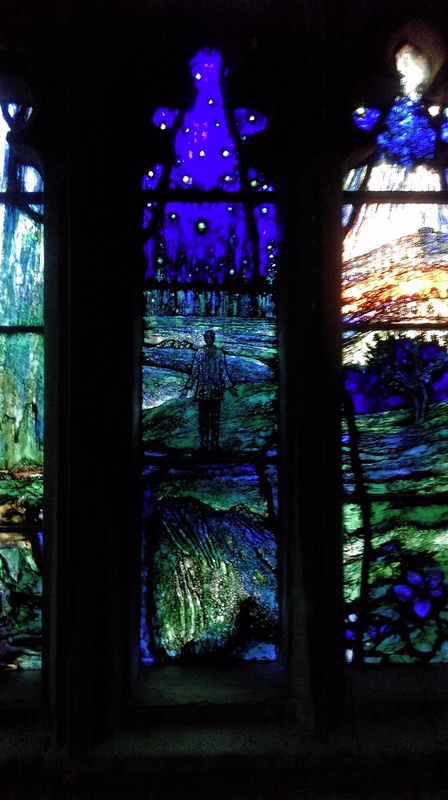 All the windows are stunning, but I’ll be honest and say that for me the most beautiful of all aren’t the massive ones, but instead I’m a fan girl for Tom Denny’s stained glass windows in the Lady Chapel commemorating the Gloucestershire poet and composers Ivor Gurney and Gerald Finzi. Sadly there’s no access to them at the moment as restoration work is being carried out in the Lady Chapel (2017), but they are jewels in the cathedral’s crown and I can’t wait to go back and see them again. If you aren’t familiar with Tom Denny’s work, he has other work in the area, including at Hereford Cathedral and Malvern Priory (and I’m still hoping to make a pilgrimage around them myself before too long). If it’s open, pay £2 and walk up to the Whispering Gallery (you’ll see signs). It’s one of those lovely acoustic quirks that means someone standing at one side will be able to ‘whisper’ to someone on the other side and be heard over there. Don’t be shy, try it! Oh and the added bonus is getting probably the best view of the East Window. So there you have this history-junkie’s ‘five not to be missed’. Of course it’s impossible to condense such a splendid place into a handful of highlights, your’s will almost certainly be different (please do share your own highlights too). Oh and one more thing – if you wander around to the side of the cathedral, there’s a superb cafe with excellent food, free WiFi and (ahem) the necessary facilities. I love it when there’s somewhere comfortable to get a good coffee while I read a guidebook and make my notes. Much more eye-candy of the cathedral here. There are numerous books about Edward II and his reign. One of the best resources I’ve found for finding further information is the website of historian Kathryn Warner who has written extensively about Edward. There’s much speculation about the relationships between Edward II and Isabella and Isabella and Roger Mortimer, which inevitably has provided inspiration for historic novels. I can’t claim to have read any of these, but should I? Does anyone have a recommendation? Robert Curthose’s colourful life in Wiki detail is here. Here’s the website for Tom Denny’s achingly beautiful stained glass. If you’re planning a visit, this is the Cathedral’s official website. What have I missed that you’d have liked to know about? Do tell, I’d love to hear. Last week I decided to unleash my inner history junkie onto Instagram and committed to regularly sharing pictures and snippets of history-related trivia on my gallery there. If you’ve been coming here to my blog for any length of time, you’ll already know that exploring British history through visiting the places where it happened is the thing I want to be doing most if I’m not stitching – in fact the truth is that some days I actually want to do it more! The thing that really gets me excited is knowing that there’s such a massive amount of heritage surrounding us, wherever you are in Britain, there will be something fascinating nearby, quite possibly even under your feet. We can trace our history back through the centuries and visit places where our ancestors stood thousands of years ago right up to the present. But it makes me really sad that many people only ever get to see the major attractions, not knowing that they’re missing a huge wealth of other historic sites all with amazing stories to tell. So, I’ve decided that my mission is to wave the flag for the historic sites in Britain that don’t generally feature on the Top 10 lists of places to visit. Because wonderful though Stonehenge, the Tower of London and Windsor Castle undoubtedly are, they’re just the tip of a massive iceberg of possibilities and I hope to make a small contribution by shouting out about the sites that don’t get quite so much attention and to help them have their stories heard. My plan is to come here once a week and talk about somewhere I think is pretty special. (I’ll post pictures on Instagram too). Now if you’re reading this and thinking ‘oh crikey no, I had enough of history at school thank you very much, I can’t think of anything worse, I’m off to surf the web for a new knitting pattern’ all I can say is that I hope to avoid being a bore. There are some fabulously informative history websites (which I happen to love), but I’m not intending to do more of the same. I’m not a historian, just a history geek who loves seeing for herself, so I’m not going to be writing chapter and verse guide books, instead I aim to tempt you with titbits of information, excite you with little connections and thrill you with trivia. I know I’m not the only history-junkie out there, so if you’re currently hiding your history habit, now is the time to come out and join me. Let me know what it is that really gets your history juices flowing. What are the British heritage places you think the world should hear about? What is it that you enjoy most about making your own history trips? Where do you really want to see but haven’t been to yet? If you’re reading this outside Britain, what would you love to see explored here? How could I bring our historic past alive for you? I’d love it if you’d leave comments here or on Twitter (I’m @AnnPawley) or Instagram (dreaminginstitches). Let’s start talking history and see if we can spread the word. In 1939 a small bronze disc decorated with exquisite spiral whorls, was discovered in the sand and gravel when the River Bann was being dredged near Loughan Island, Co. Derry. it was probably made by a Celtic metal worker in the first century AD and it was this, the Bann Disc which gave me my inspiration. Who owned it, how it was used, and how it came to be in the river are all mysteries, but this one small artifact (it’s about 10.5 cm diameter) encapsulates everything enchanting for me about the Celts and especially their art. The design itself is an enduring mystery. It’s three entwined spirals is known as a triskele. People have been using this style of design for at least 5000 years. It appears on many pre-historic monuments, including the spectacular entrance stone at Newgrange. It continued to be used extensively throughout the pre-Christian era, particularly associated with Celtic art. For me the freedom of line, the organic writhing of the curves is at its best in the early celtic period. What it symbolised to the people of those times can’t be certain, many ideas have been and continue to be discussed – perhaps we’ll never really know. It appears again in Christian symbolism, usually associated with the Trinity. And now is once more being extensively used by neo-paganism, again with a variety of symbolic interpretations. What happened to the Bann Disc in the 2000 years from its creation until it was re-discovered is another unsolved mystery. As with so many artifacts we see in museums, we can only imagine their precise histories. But although we may not know their exact stories, looking closely at these remarkable artifacts you can see layers of history, a patina built up over long years, a burnishing. Most artifacts come down to us damaged or incomplete, but for me this often adds to their enchantment. It lends them a fragility and delicacy, offering us a thin but tangible thread back through time, as here, it gives us a physical if vulnerable link direct to the hands of a Celtic metal worker, a gift from the Iron Age. In creating my own version of the Bann Disc in threads, fibres and silks, I’ve tried to show the piece both as a powerful symbol with a strong metallic essence, but also an accumulation of layers, an iridescent shimmery patina, appearing to change according to the light, a fragment decayed by time. A Celtic Mystery – Ann Pawley 2017, approximately 13 x 14″ (32 x 34 cm). Do you think it works? I wish you could see it glinting at night under the lamps or by candlelight, it really does change what you see with the metallic stitches catching the light in different directions. There’s nothing better than talking stitchy or historical (unless of course its historical stitchery), so please do leave a comment. How would you display this? I’m thinking mounted onto canvas without glass, what would you do? I’m trying to decide what’s best, so any suggestions gratefully received. The original Bann Disc is displayed at the Ulster Museum, Belfast. There are many sources of information and images of various triple spiral symbols, if you want to read more, start here. To read more about Newgrange, try this website. 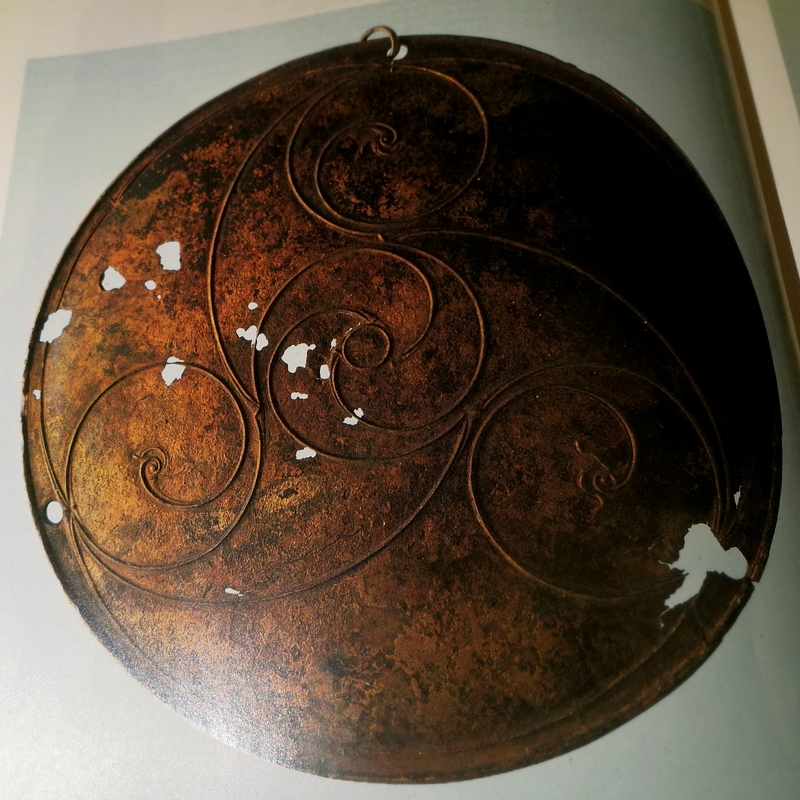 The photograph of the Bann Disc is from the book ‘Celtic Mythology’ – Proinsias Mac Cana. Just wondering, but does anyone actually own up to being superstitious these days? I sat down to write today, aware that it’s a Friday 13th – a date many people associate with bad luck – and it struck me that nobody I know seems to admit to having superstitions any more. We’re all rational beings now, looking for scientific explanations for everything and dismissing as primitive anything that doesn’t lend itself to neat scientific explanation. I started to consider how superstitious I am. Do black cats crossing my path cause me any concerns? Not especially, unless I’ve had to do an emergency stop to avoid them. Do I avoid stepping on cracks in the pavement, throw spilt salt over my shoulder or poke spoons through the shells of boiled eggs? Nope. And to be honest, I’ve always thought of Friday 13th’s as rather lucky days. …there may just happen to be a horseshoe in my kitchen window, (only for decoration of course). I definitely avoid walking under ladders (common sense surely?). I didn’t let my husband see my wedding dress before our wedding day, I don’t put new shoes on the table, I don’t open umbrellas indoors and I do occasionally speak to single magpies. Just in case you’re now thinking what a weirdo I am, I’d like to point out that the ravens at the Tower of London have their wings clipped so they can’t fly away because ‘if they do, the Kingdom will fall’ ! By the way, if ravens are your thing, I urge you to follow the Ravenmaster, Chris Skaife, at the Tower on Twitter @ravenmaster1 . He happens to have quite possibly the best job in the world. What about you? Super-stitious or super-sensible? 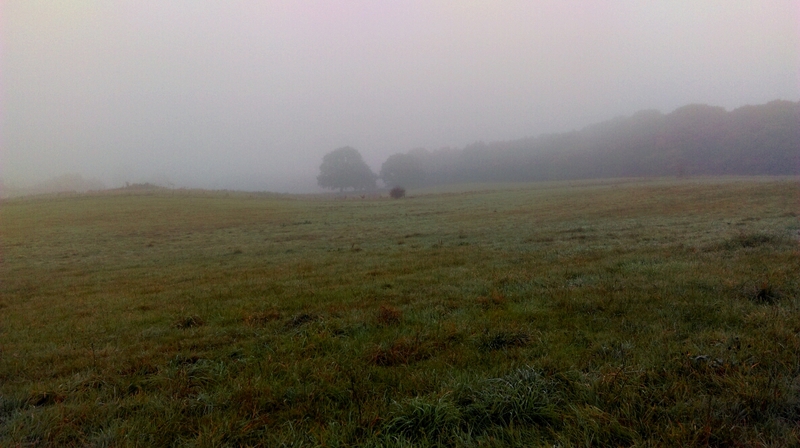 The photograph above was taken at Wayland’s Smithy, a neolithic long barrow on the Ridgeway in Oxfordshire, on a very foggy late December afternoon last year (actually our wedding anniversary). I admit to being fascinated by the creative process. It doesn’t seem to matter whether you’re a writer, an artist, a cook or any other creative spirit, some people appear to begin their creative projects knowing what they’re aiming to achieve – having a good idea of where they’re going. While for others, there’s no clear end vision, instead they have an attachment to a process and embark on their projects letting an exploration of their process determine where it goes. I suspect everyone crosses from one group to the other from time to time, it isn’t entirely black and white. Personally, I seem to spend most of my time in the process camp. I do occasionally have a clear picture in my mind of what I want to create, but much more often I simply have to start stitching without knowing much about where I’m going. I’ve been thinking about this a lot over the summer while I’ve been playing with a different process from the needlepoint I’ve been using for years. I can’t in all honestly explain where the urge to branch out came from. I could definitely point to various experiences, the visit to the Fabric of India exhibition at the V&A, reading Slow Stitch by Claire Wellesley-Smith, visiting an exhibition of local textile artists’ work – but I don’t think any of these made me think, ‘oh this is what I’m going to do’, instead I think they helped me to feel that it was ok to respond to a compulsion I was already beginning to feel. What I’m most enjoying at the moment, is seeing what happens as you combine layers of fabrics and create textures on the canvas – I’m finding this just as meditative a process as the repetitive stitch of needlepoint. Whether or not any of the end results resonate with anyone else is of course another matter – but then I’m rapidly coming to the conclusion that when you respond to a process compulsion, that’s not something you should worry about – if you did, you’d never progress, never take the risk. I like the idea Elizabeth Gilbert suggests in her book Big Magic. She says that ideas don’t really come from inside us but are actually divinely generated and just looking for someone open and willing to bring them to life – not a million miles from awen, which is my favourite concept of inspiration. Either way, it’s a lot less stressful than thinking you’ve got to come up with something in some way significant yourself. And as someone for whom the meditative process is fundamental, being receptive feels totally natural and peaceful. Ultimately if any of this is communicated through the finished work, then that’s what I’d call real magic. Much talk on the interweb of something Danish called hygge – now I’m quite fond of the odd Danish export – pastries for instance, Vikings, Sandi Toksvig (in small doses), Pilsner, Hamlet, but I’m considerably less fond of Nordic Noir, marinated herring and Danish bacon. Light a few candles: I’m with the Danes on this one, candlelight always makes me feel relaxed. I dot them about the sitting room and kitchen, pillars and tea-lights mainly, bought from the blessed IKEA (isn’t it lovely that we Brits actually burn candles these days – it wasn’t until IKEA came to the UK with their cheap candles that we stopped dusting our single pair of red dinner candles off once a year at Christmas and lit them instead). Pile up some duvets and blankets on the sofas: Probably as a result of having no functioning central heating for several years (happily now rectified), we’ve become used to wrapping ourselves in fleecy blankets or duvets on cold winter evenings while watching the TV. Cook stews in a slowcooker: I’m such a fan of these ’70s throwbacks. Chuck a few vegetables, scrag end, a stock cube and tin of tomatoes into the cooker in the morning and when it’s dinner time you’ll have a delicious effortless meal ready to go and a house that smells wonderful. Make enough for two nights and slap a piece of ready-rolled puff pastry over the left-over stew to make a pie. (I’m a vegetarian now, but I still crave a pastry crust and lashings of thick gravy). Pour yourself a glass of single malt whisky: There’s nothing better for keeping out the cold and making you feel mellow than a dram or two of whisky. Try something peaty from Islay, Laphroaig or Lagavulin, or if you’re feeling very brave (or have the ‘flu) try Talisker from Skye. If peaty flavours aren’t your thing, try Dalwhinnie or Bunnahabhain instead, both pure amber gorgeousness. Read your way through a series of crime fiction or supernatural novels: My favourites are still the Cadfael books by Ellis Peters, the Inspector Rebus novels by Ian Rankin and Phil Rickman’s Merrily Watkins series set in the Welsh Marches. They’re easy enough to pick up in charity shops and by the time you’ve read them all it will probably be spring. We’ve been watching Tony Robinson on TV – he’s got a new series on Channel 4 – Britain’s Ancient Paths – walking some of the old routes, talking to historians and staying in rather nice pubs (they didn’t ask me if I’d like to do it – I’m a bit miffed), but also there seem to be repeats of his previous history programmes on practically every time I zap the channels. And purely by coincidence and for no good reason, I’d only recently started following him on Twitter (@Tony_Robinson if you’re interested), so for a while I’d begun to feel he was becoming part of the family. The last episode I saw of Britain’s Ancient Paths had Tony walking a stretch of the Ridgeway which is claimed to have been used by locals and every invading army for over 5000 years. 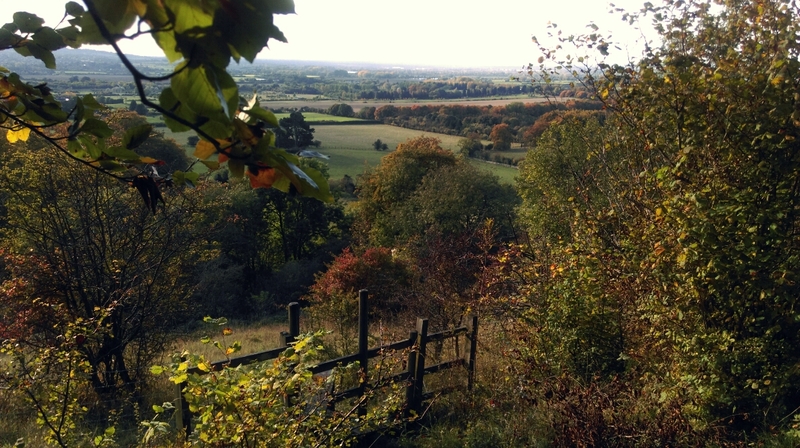 Anyway, as a result, inspired by Sir Tony and the Timotei woman, off I went up onto the Ridgeway a couple of Sundays ago, to swish my hair and admire the odd autumnal view. 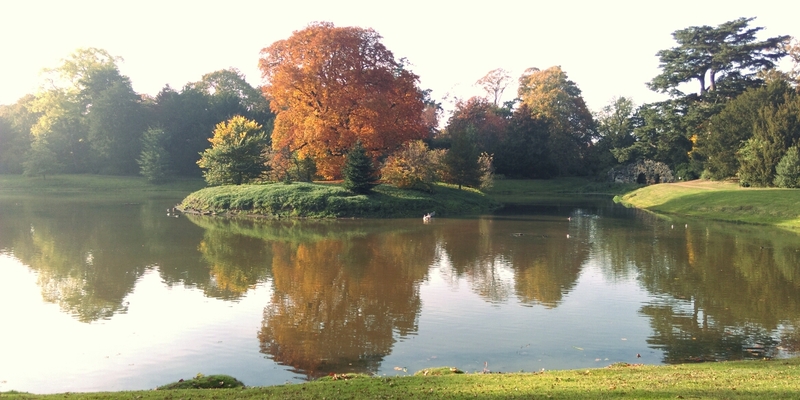 The autumn colours were just beginning to set in – we’ve had a very late-onset autumn this year don’t you think? More of a very long summer. 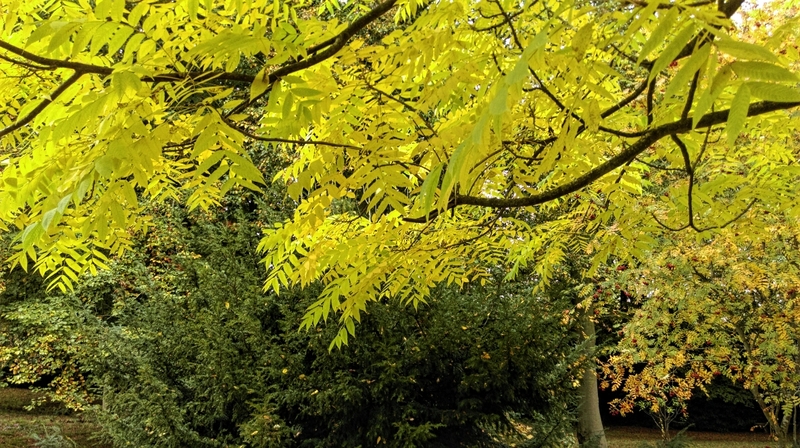 But it’s definitely changed over the last two weeks and so it was time to make our annual pilgrimage to Stowe Landscape Gardens to gasp in awe at the colours and play trains in the fallen leaves. Capability Brown as I’m sure you know changed the way we think about the English landscape by creating classical romantic idylls for his rich patrons in the eighteenth century. 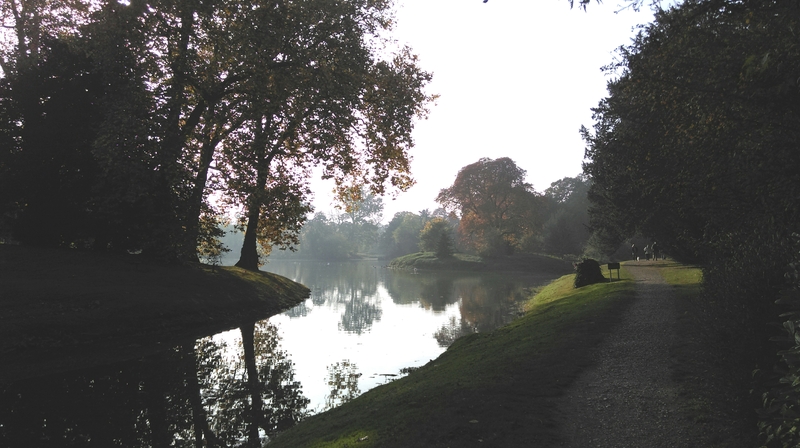 Stowe was where he first cut his garden design teeth and whatever your take on the politics of that era, there’s no denying the beauty of what he created. Brown went on to create well over 100 more of his ‘landscape gardens’ and many of them remain to this day. One which I had never visited previously is at Croome Park in Worcestershire, now owned and being restored by the National Trust. 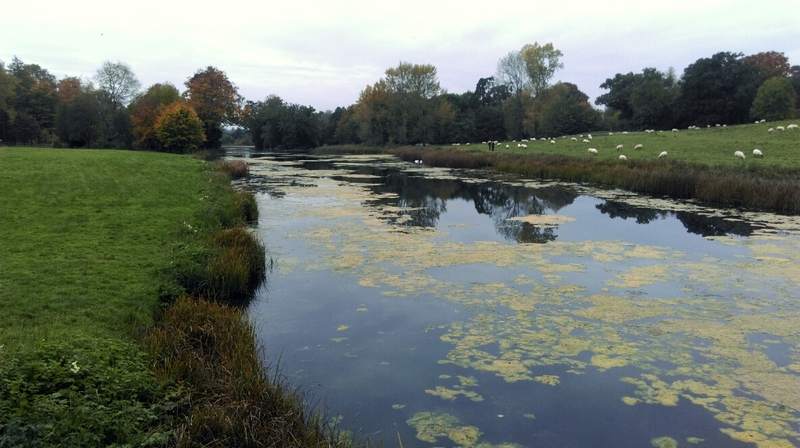 On Monday we headed over there to meet up with my big brother and what a fabulous surprise we had – Croome is just gorgeous. I’m sure the golden autumn colours and faint haze from the morning fog added a special filter, but nevertheless, what an amazing creation. Every new vista seemed to make me giggle with the complete loveliness. So much thanks to Brown and Robinson, I’m feeling well set up and ready for the colder months, embracing the seasons and indulging in my own version of hygge. Where do you like to celebrate autumn? And what does autumn mean to you? Do you have any special family rituals at this time of year? 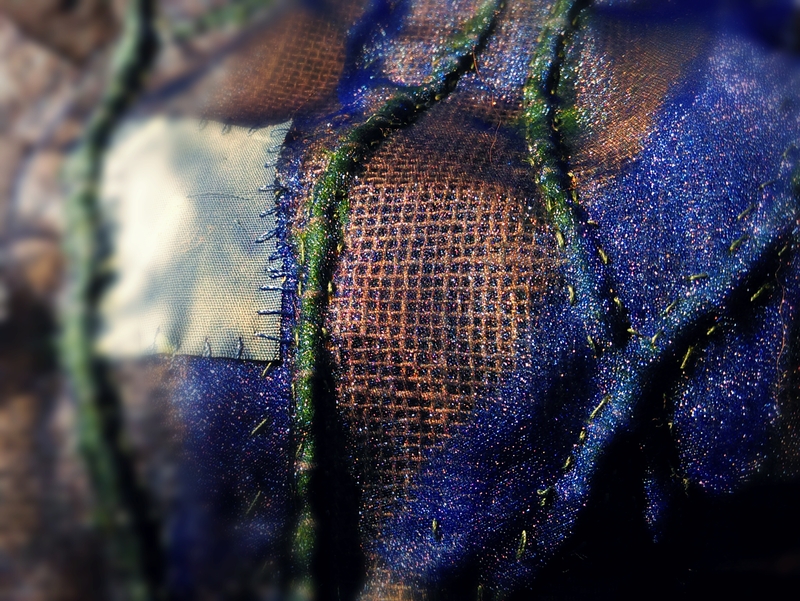 Hello, I'm Anny - a hedgerow-watching, heritage-hunting, slow-stitching textile artist. Lovely to meet you. Croft Castle – a love letter.